In Taos we are not sitting around a bonfire during our Restorative Justice Circles, or our other Circles, but I often refer to thinking of our words as feeding a fire. A fire that burns in the center of our Circle. So our words become the sticks, the twigs, the logs that feed the fire. There is something compelling about the Fambul Tok that i posted about earlier; it happens in the dark, by the light of a fire. Darkness and firelight, they are significant elements, with cultural relevance. No one is "on stage" in this setting and the night, like a dark shawl, envelopes the whole process. In that darkness, the words feed the fire, which leaps and illuminates the circle, the speakers, their words and their hearts. The people participating in the Fumbol Tok process were thoughtfully prepared to take charge of the process, and use their own wisdom and traditions. They had someone assigned to support the man who was telling about the murder of his father. Someone who came immediately to his side, to support him in speaking the painful truth, exposing the murderer in their midst, but not resorting to violence himself. The video ends with saying there may not be a difference between the Fumbul Tok at the fireside and what happens in a Circle in a classroom. I agree. We can each feed the "fire"... the warmth and vitality of life that sits at the center of our relationships. We are doing it with Restorative Justice in Taos and we can do it in our homes, our classrooms, our business boardrooms, where ever we gather and truth is needed. Where harm needs to be acknowledged and repaired. Where ever healing needs to begin. But we don't need to wait for the kind of tragedy and suffering that happens in war. We can begin the process of truth telling and heart full sharing NOW. Where ever we are, whom ever we are with. We need this. The world needs this. It always has. This quote, shared by a friend in the Phillipeanes, caught my eye today. It says it all...and Restorative Connections are about illuminating that connectedness. Its so easy to feel alone in the world, but we aren't. And while this seems to refer to other human beings its also true of our relationship to all creatures, large and small and to the earth and beyond as well. Our existence is inextricably interwoven with life. So lets give our life and our interactions the care and joyful participation they deserve. “Only through our connectedness to others can we really know and enhance the self. And only through working the self can we begin to enhance our connectedness to others.” – Harriet Goldhor Lernerell. Restorative Justice Makes a Difference. 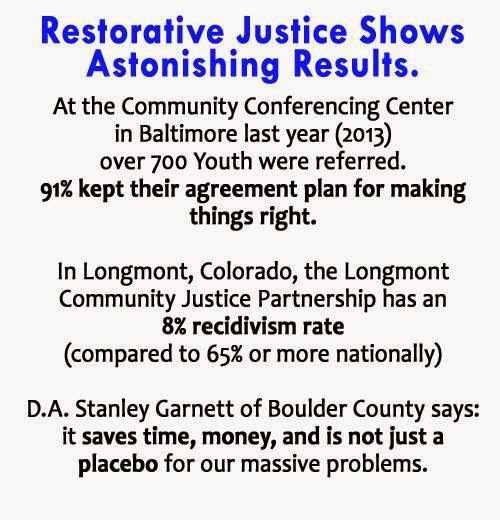 In Taos County our Restorative Justice Youth Initiative, a program of the Taos County Juvenile Justice Board, also has between 5-8% recidivism...so we are doing great! and there are "ripple effects" - improved family relations, better understanding of consequences and social norms, realization of harm done, understanding of how to repair harm, and having had the experience of listening and being listened to! 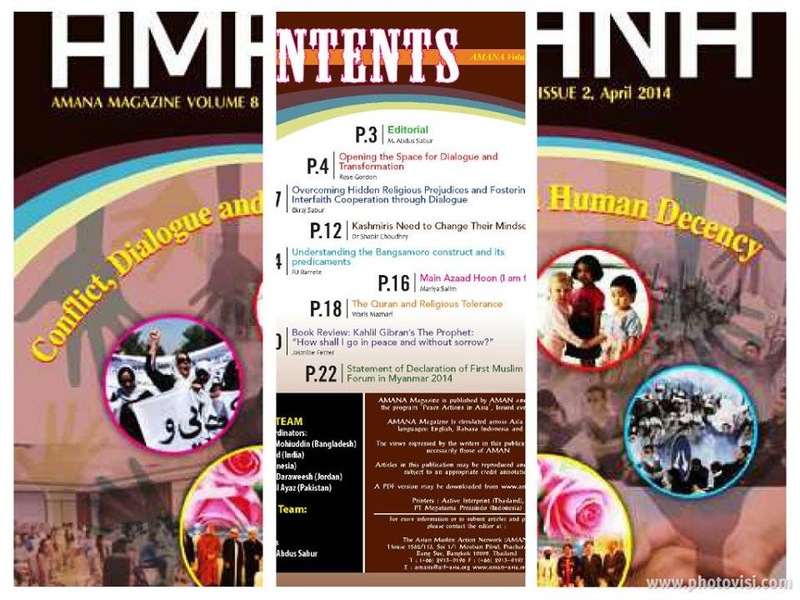 The Spring Issue of AMANA, published by the Asian Muslim Action Network. is among other interesting, informative and inspiring articles by folks involved in the Peace and Conflict Transformation work that AMAN is engaged in. We came from Afghanistan, Pakistan, Bangladesh, India, Indonesia, Philippines, Egypt, Uganda, Tanzania, Myanmar, Japan, Lebanon, Nepal, Sri-Lanka, Thailand, Malaysia and the U.S. We came in shades of white and brown, with a rainbow of national dress, music and foods. We spoke many languages, but communicated with one heart; sharing dreams of freedom; dreams of peace and justice and an end to violence. Many participants are already translating their dreams into action; working as Human Rights Lawyers or Social Workers, working in NGO’s that support and assist refugees, orphans or juveniles who attempted suicide bombings. Some are working towards Gender Rights, many works with youth. Others work in development sectors. Together the participants and resource staff represented over 160 years of experience in Peace and Human Rights Activism and related activities. IIPS arranged an impressive series of presentations for this group of educated and experienced young professionals. Presentations by Thai, S. Korean, Japanese and U.S. scholars covered topics of Ethnicity, Gender and Power, Structural Violence and Practices on Non-Violence. There were talks and experiential exercises addressing Deep Listening, Indigenous Wisdom, Conflict in Contemporary Thailand, Global Governance, Peace and Human Security, Approaches to Analyzing Conflict and Approaches to Conflict Transformation as well as new information on the experience of Fukishima and movements towards Asian Democratization. Visits to Buddhist Temples, Mosques and Christian Churches were part of the curriculum along with time at rural, self-sustaining inter-faith communities in Bangkok and Chiang Mai. Everyone was both teacher and student at IIPS, discovering commonalities, exploring differences and celebrating diversity. Late night discussions covered everything under the sun. At IIPS, PEACE is not just a word or a theory. It’s translated into action - sharing a room with 1 or 2 “strangers” who become friends; eating and working on presentations together, laughing and dancing and listening to each other, even if it occasionally gets uncomfortable. Perhaps most profoundly, each of us was offered an opportunity to leave our “comfort zone” and step into new, slightly riskier spaces, where old ideas, historic grievances and suffering, mistrust and misinformation could be heard and received. In those spaces minds and hearts could break open, forever expanded and transformed. Thank you to the entire organizing team for your vision, hospitality, thoughtfulness and commitment in providing a life-changing experience and depth of learning for all of us at the 2014 IIPS Peace Studies Course.